Truckee has always known how to throw a party. Local history tells of winter carnivals in some form every year since 1909. C.F. McGlashan, teacher, newspaper editor, lawyer, scientist, author, politician and historian of the Donner party tragedy, masterminded the idea. He decided that the town needed a major tourist attraction. In the winter of 1893-1894, McGlashan supervised the construction of the first ice palace, smack dab in the center of town. It was made of chicken wire, which he repeatedly sprayed with water that would freeze and produce a solid wall of ice. The earliest ice palace was nearly a fifth of a mile around with walls 50 feet high. Inside was an oval ice skating course. At one end of the palace was a tower from which excited tobogganers could slide down to street level. Nobody seemed concerned that this monstrous creation covered more than half the main street, blocking horse and sleigh traffic. The success of the first ice palace resulted in similar edifices being fashioned in later years, becoming a major draw for thousands of visitors who passed through the town by train. The idea evolved into the earliest winter carnivals. In 1913 plans were made for the largest winter carnival ever held in Truckee. 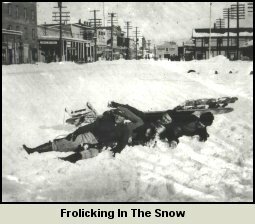 The event was so special that townspeople named it “Fiesta of the Snows.” The goal was to pump up the local economy by bringing thousands of winter tourists to Truckee. In November of that year, the chamber of commerce decided that a permanent ice palace was needed. Plans called for a massive structure, the grandest ever, to be constructed of expanded metal, so that when it became cold enough it could be sprayed with water to form ice which, when decorated with lights, created the illusion of a grand ice palace. A corporation was formed to acquire land at the west end of today’s southwest river street, below Hilltop. A new footbridge was built across the river so people could easily walk to the palace from town. A committee, composed of Bert A. Cassidy, Tim O’Hanrahan, P.M. Doyle, J.G. Kirchner, Ben Kiernam and Charles Siegle was appointed to make sure the project was completed before the first snowfall. The chamber of commerce provided $10,000 for the project, a tidy sum in those days. The new ice palace was gigantic. It included an ice-skating rink, a dance hall and a number of cozy rooms with fireplaces for people to rest after a day of playing and frolicking in the snow. 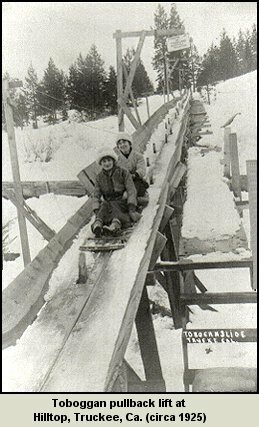 Two new toboggan runs were constructed providing exciting rides of over a mile long from Hilltop down to the front of the ice palace. A special pull-back lift was already in place to lift the eager tobogganers back up the hill. Many old-timers still believe that this was the first mechanical lift of its kind in the country. On December 11, 1913, the new ice palace was completed. Diverting water into the building from a natural stream flooded the ice skating rink. As a final touch, the exterior walls were lighted up in brilliant colors and the interior was decorated with hundreds of fresh roses. A large “Ice Palace” sign was placed on top of the building and another sign over an arched entry greeted visitors with the words, “Glad-U-Kum.” Nearly every building in town was handsomely decorated with red and white ribbons, adding to the carnival atmosphere. Amid great fanfare, opening day was held on December 27th. Everyone who helped with the project attended the festivities. The chamber of commerce hired a special orchestra featuring six Hawaiian musicians dressed in colorful winter costumes and featuring a beautiful Hawaiian princess who sang in her native language. Members of the San Francisco Chamber of Commerce were invited and arrived on special trains. Every hotel in town was full while local merchants enjoyed record profits. Reporters from major newspapers were on hand to cover the event. By nightfall the festivities were enhanced by a huge lighted outdoor Christmas tree on top of the hill, which, along with the ice palace below, illuminated the landscape with a wonderful winter glow. Horse drawn sleighs jingled, as delighted visitors were taken on moonlight excursions from Truckee to Donner Lake and back. The Festivals Association of the Pacific Coast praised Truckee for its tremendous efforts. Newspapers in San Francisco provided extensive advertising and the Central Pacific had to increase the number of special trains. Large groups, including the Rotary and Eagles clubs, arrived in town on their own chartered trains. The new ice palace and winter carnival of 1913 was such a success that an even larger event occurred in 1914-1915. This event featured sled dog racing and a memorable visit by writer Jack London. Winter sports had become a major event in Truckee. Truckee’s last great winter ice palace burned to the ground in 1916. The pond that remained continued to be used for ice-skating, but was difficult to keep cleared of snow. In 1958, N.F. Dolley, president of the Truckee Chamber of Commerce, explored the possibility of erecting some sort of icy creation for the tourists expected to arrive for the 1960 Olympic Games, however his dream was never realized. Again, in 1994, much excitement arose when a marketing firm considered building a modern ice palace on land across from the C.B. White House, however, due to concerns over costs and liability, the idea never became a reality. Today, only a mountain meadow remains where the grand old ice palace once stood. In the summertime wildflowers grow alongside the stream, which once flooded the ice rink. Only a few old timers remain who can tell about the toboggan slide and those glorious winter days filled with youthful friendship and endless fun.